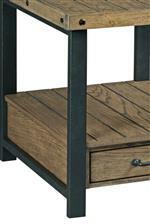 This Sofa Table perfectly epitomizes the rustic-industrial craze prevalent in contemporary homes. The piece features a gorgeous rustic brown finish over oak veneers that pair beautifully with the textured gray finished metal components. Iron handle hardware and exposed bolt heads further reinforce the aesthetic. As storage goes, you receive two middle drawers perfect for stowing away clutter, while the two open shelves provides good display space. The Workbench Rustic-Industrial 2 Drawer Sofa Table by Hammary at AHFA in the area. Product availability may vary. Contact us for the most current availability on this product. As the collection name implies, these occasional tables hearken to a sentiment of hard work and a pastoral living. Heavily grained, flat cut white oak veneers bring the natural world indoors, while the metal components add that highly sought after industrial touch. The Workbench collection is a great option if you are looking for Rustic Industrial Contemporary furniture in the area. Browse other items in the Workbench collection from AHFA in the area.